About 40" high. Many chairs are not used for sitting. About 40" high. I put a table around the Art Chair and set a knife and fork on the top and renamed it Sit Down Dinner. 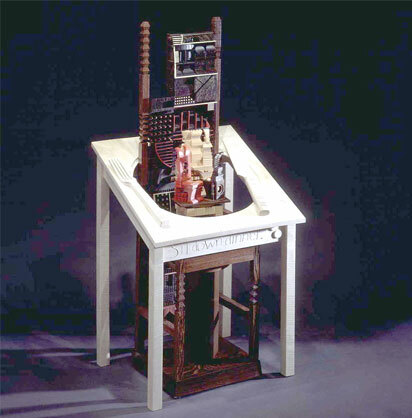 It was exhibited at the Charles H. Wustum Museum of Fine Arts in Racine, Wisconsin. 96" high. I received a commission from a collector in 2001 to construct two tall columns entitled Heaven and Hell. The chair and many other objects stored in different corners of my studio were incorporated into the structure of Hell. When the stock market suffered in 2001, the collector had financial difficulties, so Hell languished for over a year in my garage. Last year he asked me to remake Hell because it reminded him of the recession. Hell was taken apart and most of the parts, except the Art Chair were remade into From Hell To Heaven. 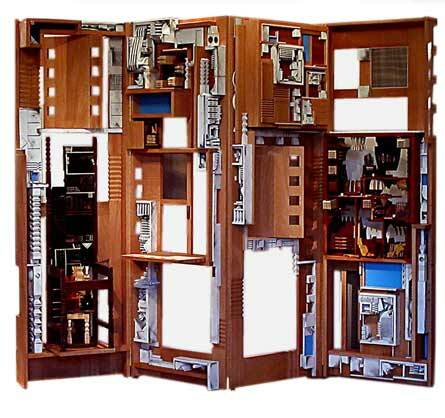 In 2003, with a commission from another collector to create a folding screen, I included the Art Chair into the structure. On seeing the finished screen, the purchaser was not happy. Later in the year I shall be dismantling again in the hope of arriving at a conclusion. Perhaps I'll be happy to be continuously creative.